HABIT: Catnip has gray-green foliage and bushy growth. Catmint is a woodier and more compact plant with tiny gray leaves. Catnip has a hot peppery flavor. Keep it cut back and don’t allow it to flower. CULTURE: Easy to grow but does best in healthy, well prepared soil. Trim back hard when the plant gets floppy. USES: Tall, gray-leafed groundcover. Toys for cats. Repels insects. PROBLEMS: Cats go nutty for it. HARVEST: Harvest and dry foliage before it flowers. NOTES: Nepeta mussinii is catmint. Cats are not as attracted to it as they are to catnip. Catnip is a perennial herb belonging to the mint family Labiatae, botanical name Nepeta cataria. 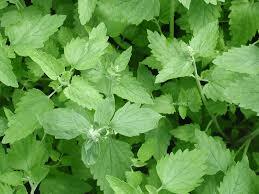 It is a mint that has naturized in North America and Canada after being introduced from the Mediterranean. It is very easy to grow. Some cats go crazy for catnip but it harmless. Cats have a special receptor for the catnip active ingredient, Nepetalactone. It is located in the cat's hard palate (roof of the mouth) and is called the vomeronasal organ. Nepetalactone is not addictive or harmful for cats. The behavioral response can be very dramatic in some cats - rolling, licking, rubbing, drooling, jumping, running. Other cats become sedate after exposure. Young and senior cats do not tend to respond as much, or at all to catnip. The response to catnip seems to be genetic; 10-30% of the cat population does not respond to catnip at all, at any age. Catnip can give you some entertaining moments and is nontoxic to cats. If a large quantity of fresh catnip is consumed, you may see some vomiting or diarrhea, but it’s rare. If this happen, limit or eliminate the catnip.